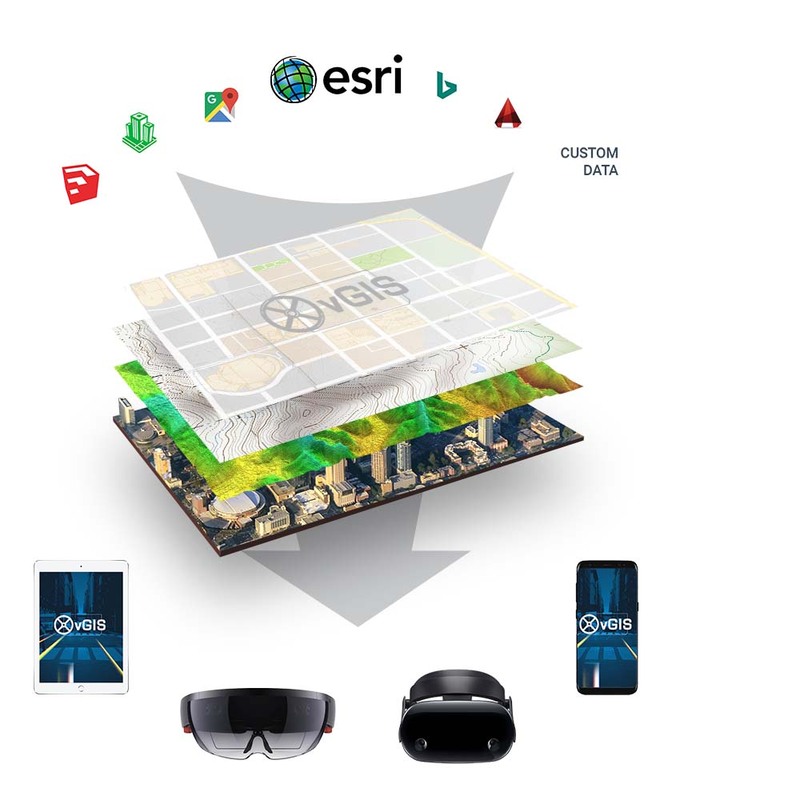 Transform traditional Esri GIS data into augmented reality displays and holograms. Simplify fieldwork, increase safety, gain new insights and reduce errors and delays. vGIS is a visualization platform that transforms traditional GIS, CAD and other types of data into stunning augmented reality visuals to solve real-life challenges. From displaying existing infrastructure in the field to visualizing proposed designs on the construction site in full 3D, GIS-powered vGIS products are deployed around the world to simplify field services, improve productivity and safety, and optimize decision-making. What makes vGIS the most advanced augmented reality solution for GIS? Find out by clicking the button below. Explore our award-winning products built with the holographic, augmented reality, GIS and CAD technologies. Gain the x-ray-like ability to “see" through the ground to simplify utility locates, assess hidden infrastructure and increase productivity. See wellbores, frac stages, geology and microseismic events in full 3D. Optimize analysis, planning and production by visualizing 3D information as 3D holograms. Unlocks the power of Microsoft HoloLens to visualize CAD and GIS information as holograms to create a natural extension of the real world. You know what you want from your GIS data, and we’re ready to help. vGIS-powered custom applications can give your GIS a new purpose: to solve real-life problems. Building the most advanced augmented reality platform for GIS requires more than internal talent. We are proud to partner with these industry leaders. Meemim has pioneered vGIS technology, allowing organizations like ours, to literally 'see' underground utility locations, in the field, via Microsoft HoloLens. Truly innovative, truly transformative. From a crew of two to major multinationals, vGIS is suitable for clients of any size. Meet some of our clients just like you and learn how they use vGIS. … but what about the real-life benefits? Explore vGIS products to find out how they can improve your operations.